BRIDGEVIEW, Ill. — The stereotype of mid-20th Century hootenannies evoke well-defined images in our collective imagination: A group of earnest beatniks trading guitars and singing obscure folk songs while confined to cramped, smoke-filled rooms. While there were undoubtedly important social and musical dimensions to these gatherings, hootenannies’ key premise was to educate its attendees about the history of folk music. They were a kind of communal lecture delivered via acoustic guitar. Reaching back to his back pages for inspiration, Bob Dylan has taken the hootenanny concept to a bigger stage with his latest brainchild, a package tour billed as “AmericanaramA: Festival of Music,” that features younger acts like Wilco and My Morning Jacket who also share a keen reverence for roots music. At the traveling show’s stop in Chicago at Toyota Park on Friday night, the performers captured much of that old folkie spirit of collaboration and musical joie de vivre even if instead of “educating” an apartment of comrades, it was an arena of fans. And rarely has such a six-hour lecture left such an impression. To be fair, the more skeptical among us might suggest Dylan and his people threw together this tour to bolster the anemic ticket sales the legend experienced when he toured the U.S. last fall. And if this were true, Friday’s show — held at a soccer stadium south of the city’s downtown – failed to meet their sneaky expectations. The open-air facility was only half-filled. But for those in attendance, what they saw and heard what was another likely motivation behind AmericanaramA: Giving fans a Dylan-approved cross section of American roots music’s past, present and future. Surely, hiring acts like Wilco and My Morning Jacket couldn’t help but draw in a younger demographic to the show. One might think Dylan and/or his entourage knew his openers had a healthy respect for the styles and forms that came before. But more than that, they also might have found something simpatico between the Bard’s relentless creative evolution and those of Wilco’s Jeff Tweedy and My Morning Jacket’s Jim James — albeit on a much less dramatic scale. Dylan knows all too well how traditional music can nurture and inform music-making, but also how it can be a straightjacket that true artists will seek to slip out of from time to time. On this stop of the 33-date trip, the concert opened with former Fairport Convention guitarist Richard Thompson’s trio. (Other tour spots will feature/have featured solo performances by former Grateful Dead guitar player Bob Weir, ‘90s alternative-rock auteur Beck Hansen and Millennial singer-songwriter Ryan Bingham.) Thompson initially earned fame in ’60s British folk circles but garnered greater acclaim for his ’70s albums with his former wife Linda. Like Dylan, Thompson was another musical elder statesman offering some schooling to the young people gathered in Chicago. His smooth, languid playing over five songs offered ample evidence of his six-string skills, but more importantly, how American music, like blues, country and rock, evolved from older European traditions. These sounds then returned back across the Atlantic to influence other generations and beyond. The black-bereted Thompson and his group’s playing was intimate, almost introspective and inviting. Thompson’s onstage stateliness was truly more of a recitation than a barnburner. My Morning Jacket, in contrast, was born to rule an arena. The group’s performance was loud, the grooves thunderous and frontman Jim James’ onstage performance was swashbuckling. Fitting Dylan’s vision for this tour, My Morning Jacket began as a generic Southern classic-rock band when they formed more than a decade ago, but in recent years, they’ve been branching out to embrace new styles and sounds beyond Neil Young vocals and crunching Les Paul guitars. The band is clearly on the path, but they’re a group still looking for their careers’ definitive artistic statement. My Morning Jacket’s set was cherry-picked songs from throughout their discography. While the rest of the Kentucky-bred five-piece look like they could be members of an Allman Brothers cover band, James was a blue-caped, red-bearded Gandalf directing the onstage magic show. He prowled the stage, swirled to the crashing music, howled into the microphone, played some saxophone and gave some much needed bombast to the proceedings. The band moved further from their roots-y bread and butter later in their 12-song set. “Wordless Chorus” and “Phone West West” both featured relaxed versions of a reggae rhythm. James ditched his strange serape for a towel covering his head and as his fashion choices belied, he was most interested in chilling out the swaying throngs. Thankfully, James and company woke everyone from their haze with closer, “One Big Holiday,” which returned to what the group really does best. With band unleashing scalding riffs and explosive drumming, James sounded like he was hollering from the canyon bottom. “If we holler loud and make our way,” James sang, “We’d all live one big holiday.” The lyric could be a mantra for My Morning Jacket, and the group was intent on getting everyone in the audience to celebrate this moment. Unlike My Morning Jacket, the Windy City-based Wilco crew is a more mature and calculating bunch — live and on record. Both groups have sought to prove they’re more than roots-rockers, but Tweedy and friends were far more aggressive in ditching steel guitars and country harmonies in favor of Sonic Youth pretensions. Over the last couple of albums, however, Wilco has relaxed in its members’ artistic militancy and are more settled in its collective skin. Their set Friday night was mostly low key and struck somewhere between audience-friendly career retrospective and moments of artistic diversion. From the first moment Tweedy strode onstage, one could see his willingness to embrace the band’s earliest influences. Dressed in a white cowboy hat, a horribly ugly checked sport coat and jeans, he looked like a husky, mismatched Dwight Yokam. The band was relaxed and precise in its performance from the opening notes on. This was a full-spectrum presentation of Wilco’s music and it was nothing short of spectacular. Wilco eased into this festival with two earthy rarities, “At My Window, Sad And Lonely” and “When The Roses Bloom Again,” both cuts from the “Mermaid Avenue” period, their collaborative albums with Billy Bragg that attached melodies to old Woody Guthrie lyrics. As Tweedy has admitted before, he used “The Basement Tapes,” Dylan’s own mid-’60s folk/country/blues woodshedding with the Band, as a template for the “Mermaid Avenue” songs. With the country-flavored, windswept mournfulness of “At My Window, Sad And Lonely,” Tweedy demonstrated his command of those lessons, singing with a simmering longing as only true songwriters can break your heart. Tweedy was a powerful balladeer, backed up with harkening harmonies from bassist John Stirratt and others, as guitarist Nels Cline introduced pitying lap steel guitar wails. “When The Roses Bloom Again” was equally downcast, but had a more gentle, rollicking pace, again augmented with Cline’s whimpering steelwork. With this kind of an introduction, Wilco might have called Nashville home instead of Chicago. A performance of “Misunderstood” was the first song of the night that elicited mass cheering from its first few words and the cut constantly threatened to veer into a booze-y singalong. While long a staple of Wilco’s live repertoire, it’s no secret that the song was conceived as Tweedy’s artistic declaration of independence — that his influences extended from Buck Owens and the Carter Family to Television and krautrock — and its inclusion here couldn’t have been coincidental. This set the pattern for the rest of the performance. Tweedy would often let his Rust Belt-roots show through on some songs — with marvelous results, but he’d then steer the band to more dissonant, abstract music from the Wilco catalog as a counterbalance. Pretentious or not, few could resist the likeable piano bounce of “Hummingbird” or not be impressed by the polyrhythmic, art-rock attack of “Art Of Almost.” (At one point, Tweedy cupped his hands over his mouth to be heard above Cline’s screechy soloing and drummer Glenn Kotche’s frantic skinwork.) Soothing, post-modern songs like “Poor Places” and “Impossible Germany” were stripped of their studio-created nuance and became midtempo pretty ditties projected at large. Song after song, there was a Pink Floyd coolness and laid-back vibe to the group’s playing. Things got louder and more in your face when James and other members of My Morning Jacket joined for a note-for-note cover of Neil Young’s “Cinnamon Girl,” which was no doubt a common touchstone for both groups. It the selection of song was a little obvious, one can’t gripe about the power and beauty of their rendition and the gusto with which the bands took to it, an intensity that would have likely left Young and Crazy Horse wheezing. Whether it was rawking with My Morning Jacket or doing a little picking with Thompson, Tweedy and Wilco demonstrated that the group was the most flexible and inscrutable act of the day. (And with Dylan on the bill, that’s saying something.) The group proved that the younger generation shares the Bob of yesteryear’s ambitions, but is taking it in new and exciting directions. When it came time for black-suited Dylan to take to the spotlight, it was literally a hard act to follow. Flanked onstage by two pillars of gas-powered fire, Dylan and his five-member backing band looked like the seasoned pros they are. Dylan has become a different touring animal the last few years than he was at the height of his “Never Ending Tour.” He lacks the instrumental fireworks or musical spontaneity that is traveling partners are open to. Instead, Dylan’s show has slipped in recent months into a well-oiled machine, apparent from his band’s matching suits to the rather staid set list. While Bob and his boys used to live on the edge night after night — improvising how the song was presented, mixing up the set list and jamming a little — things have changed. As if a subconscious signal of what’s now blowing in the wind, Dylan started with “Things Have Changed,” a latter-day gem that testified to Dylan’s darker world view and his enduring gifts for lyrical turns of phrase, but it was far from a rote performance. The song has evolved from a steady guitar strum to a fast-paced, country locomotive. Guitarist Charlie Sexton tossed in a couple of accenting licks while bassist Tony Garnier’s standup instrument proved uncannily elastic to push the melody forward. Dylan stood center stage and sang like a ghoul, growing and menacing about the world gone wrong and how he could care less. Whether Dylan truly cares or not doesn’t factor in. His playing it safer and safer in concert shouldn’t be misunderstood, nor should we condemn his heavy reliance on stylistic borrowings for his recent materials. If Dylan of the ’60s morphed from folk-music devotee to rock renegade and changed the world, the 72-year-old Bob is done with breaking down barriers and firmly committed himself as preserver of older forms. His retro-loving music draws exclusively on sounds of the ’50s and earlier and he has positioned himself as the old-timey keeper of the flame. Brand-new songs like “Soon After Midnight,” “Early Roman Kings” and “Duquesne Whistle” got their Chicagoland debuts, but they made little of a splash, blending in with older material to showcase Dylan’s unique form of musical “edu-tainment,” a kind of cultural historiography told through derelict American styles. The crooning “Soon After Midnight” featured a solo by Sexton that could have been grafted onto ’50s rocker Ritchie Valens’ ballad “Donna.” Getting grittier, “Early Roman Kings” lunged and lurched thanks to a framework of Muddy Waters blues first born in small clubs only miles away from this soccer stadium. “Duquesne Whistle” was snappy take of jump blues that got a few bobby soxers young and old dancing through the aisles. Sexton again got the gift of a well-paced solo that exuded grace and fluidity. Most surprising was how Dylan seemed more willing to let his players stretch a little. Precision over heart has become a hallmark of recent Dylan performances, but Sexton fought the trend with a handful of solos on this night. On previous tours, he appeared penned in by his boss’s desire to show off his own meager keyboard prowess. (After many of years of service with the master, Sexton left Dylan last year. However, he returned to the fold weeks ago after his replacement, blues guitarist Duke Robillard, suddenly departed the current tour under mysterious circumstances.) Whether as a reward for returning or representative of the boss’ change in attitude, allowing Sexton off the leash gave the performances some needed energy to play off Dylan’s croaky loquaciousness. 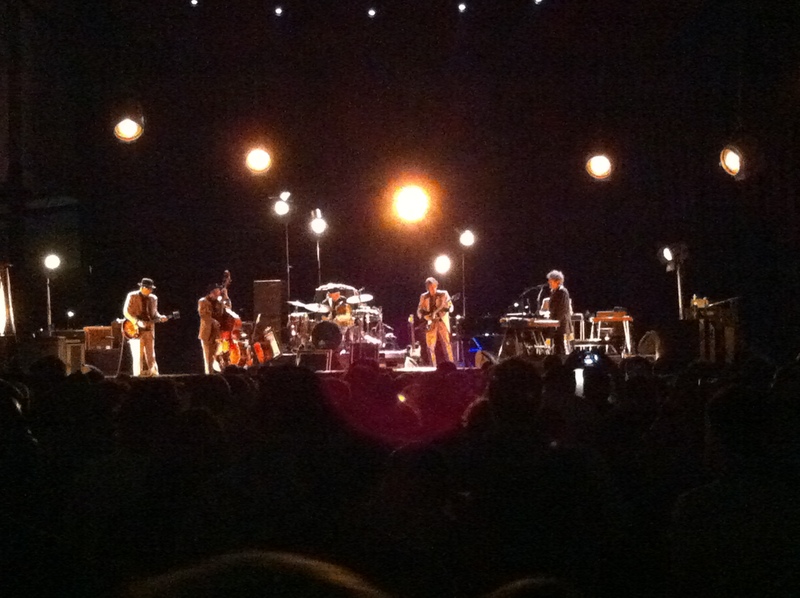 To be sure, one could hear the energy level of the band wax and wane depending on where Dylan was onstage. If he was center stage and singing, the band was focused and adding subtle flairs after each line. When Dylan moved to the side of the stage and pitched in some scattered piano, the combo appeared distracted and preoccupied with not tripping up over Bob’s fickle phrasings. Dylan and his minions were at their best when he played the grouchy frontman, proselytizing like a gloom-obsessed tent-show preacher or cursing love like a grit-voiced barfly. “Love Sick” was a bitter tale of love set to a staccato rhythm that slowly tensed up like a winding spring before literally catapulting Dylan’s voice forward. A puffing harmonica solo hissed disillusionment. It’s melodic mirror image was a reconceived “She Belongs To Me” whose central guitar chords recalled the after-hours vibe of his “Blonde On Blonde” period but paired with a new, driving martial rhythmic beat and cooing steel guitar. Dylan’s wheezy harp solo too was a blast from the past. It peeled into the upper registers, recalling passion of the old days. Dylan’s sonic explorations continued from there. There was the snaking “Beyond Here Lies Nothing” was a Bayou tango. The banjo-laced “Blind Willie McTell” was redone as a tribute to the traveling minstrel shows. “High Water (For Charley Patton)” was a moon-lit slice of country blues that included two extraordinary Sexton solos that slightly recalled the nimbleness of late blues-hot shot (and Chicago native) Mike Bloomfield. Guitar was again a focal point when Sexton and his mentor attempted to outdo each other during another ’50s hopper, “Summer Days.” Sexton’s guitar and Dylan’s piano vamped and bounced off each other in a mid-song duet that was so playful yet intense that at song’s end, multi-instrumentalist Donnie Herron was smiling and clapping to cheer on his employer. Despite a messy, sped-up take at “All Along The Watchtower,” the crowd called them back for one more lesson. But for all the adulation, Dylan returned to the shadows and his morose carnival barker routine for set closer, darkly tender “Ballad Of A Thin Man.” The piano pounding underscored the music’s spooky vibe and the groove was spindly. The glum tone matched the song’s infamous refrain, “something is happening here but you don’t know what it is.” If this was how Dylan wanted to conclude his recital, it was more of a final denunciation in humankind — perhaps doubting that the audience picked up very much after an hour and a half of schooling — than a kind of final “Kumbaya.” After all these years, Dylan is still the sphinx. Dylan’s hootenanny might have ended on an odd note, but one can’t ignore what he and his tour-mates achieved. They reminded all who came the wonders of American music. And with equal respect for history and creativity, they proved this music will endure into the future. ©Copyright 2013 by David Hyland. All rights reserved. This material may not be published, broadcast, rewritten or redistributed. Tags: 2014, AmericanaramA, Bob Dylan, Chicago, Folk, hootenanny, July, My Morning Jacket, review, Richard Thompson, Toyota Park, Wilco. Bookmark the permalink.